So, I hit some road bumps in my efforts to make my own skin products. It happens to everyone, right? Right? Anyway, what happened was that I tried to change my original formula once the first batch of oils was used up. So instead of apricot oil as carrier, I thought of using jojoba, because I had read very good things about it, like the fact that it is the vegetable oil most similar in composition to sebum. It all worked fine. I was happy. Sure, I started to be bothered by this pesky eye infection soon after changing the oil formula, but that was irrelevant. Or actually . . . not quite? 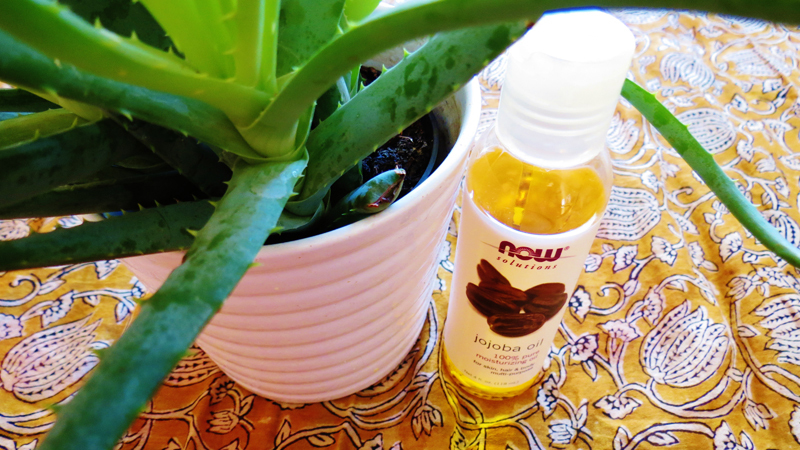 As soon as I stopped using the jojoba oil, my eyes slowly started to return to normal: the eyelids were not dry and crackly anymore, and the tears were not burning my eyes. After about a month now, my eyes don’t look like I’m eighty anymore. Yay! Turns out I am allergic to jojoba oil, and according to the same Internet that recommended the thing to me, I am not the only one who’s allergic to it. So this natural face care system is not foolproof. Not at all. But it is still worth it for me. I think. I’ll keep trying. I may spend my thirties looking like I’m eighty, but when I turn eighty . . . watch out! In any case, my advice to you, if you try this thing yourself, is to start with very small batches and test them for a while, paying close attention to any changes in your skin. This way you will avoid any long-term damage to your skin and your wallet. Best of luck! Made my own natural skin products. Aren’t I crafty? A few months ago I became obsessed with creating the perfect skin care regimen for myself. I was very unhappy with my face. Something had happened: first, some hormonal issues that produced some ugly red spots. Then, I had just realized that my favorite skin cream, which I buy in bulk from Romania every other year and keep in the fridge and use religiously for every skin problem, as a night cream and day cream too, this fantastic product, although largely clean, is based on petroleum jelly. Now, petroleum jelly doesn’t seem to be too harmful–on the EWG Skin Deep Cosmetic Database (one of the best resources for checking the harmful ingredients in your day-to-day cosmetics, which is why this is my favorite organization to support) it is listed as a 2 toxicity level, on a scale from 0 to 5. This is not too bad. But it comes from petroleum, and although a natural resource, petroleum use is harmful in many ways for the environment. I would prefer to use on my skin products that grow under the sun, products that are not too far removed from the dinner table either. So I started my research and my squirreling of little bottles in my little fridge. I made one combination of oils for nighttime and one for daytime. For daytime I use apricot kernel oil with argan, tamanu and calendula oil. Apricot oil is a light carrier oil, although it also contains essential fatty acids good for the skin. Argan oil is quite popular right now. It is produced from the argan tree nuts almost exclusively by cooperatives of women in Morocco, where the tree originates. Argan oil is very rich in vitamin E, anti-inflamatory, UV-protectant and healing for the skin. Calendula oil is my favorite because it is used in my part of the world. Calendula flowers grow abundantly in Romania and are a common ingredient in many health products. I can swear that it heals anything. Tamanu oil is another magical ingredient that has anti-aging and healing effects on the skin. Look at all the bottles and jars. It makes me feel like a crafty little witch. For the nighttime use I made a mixture of the same argan oil, with rosehip seed oil and rose otto oil. Rosehip seed is meant for rejuvenating aging skin, just like the rose otto oil, except that rose otto is much more expensive, so I use just a bit of that, mainly for the smell. I think that rosehip seed oil is miraculous and simply erases wrinkles. It barely seems real. 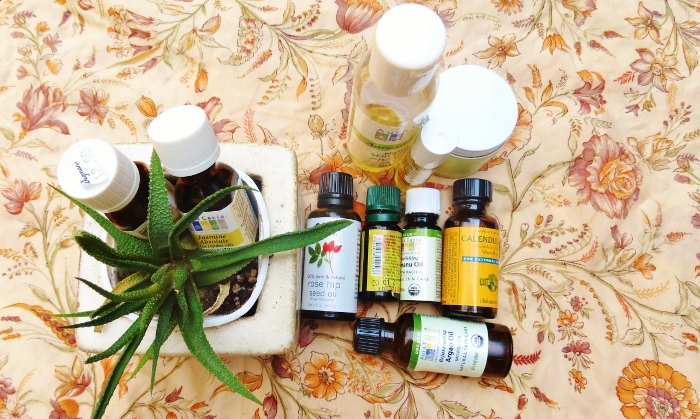 Natural oils and ingredients for any natural products are easy to find these days, and the fun of creating your own concoctions along with the guilt-free use are definitive arguments for me in favor of homemade cosmetics. If you have tried making your own skin lotions, please let me know about it. There is so much to learn and I can never have enough of this topic. I bet some of you do, though, so I am going to stop with this now and quietly take off on my broom. Yes, it’s been a long time since I wrote about soaps, but now I am so excited about my new discovery that I had to share it. With cosmetic products, I usually do my research, read the labels and settle on a brand based on both price and natural-factor. As it is quite a long and frustrating project, I usually stay faithful to a brand or product type for a long time. For example, ever since discovering the castile soap, it has remained the only liquid soap we have been using in our home and I am very happy with it. For solid soaps though, which we use too, I hadn’t found a convenient source. I kept buying them from fairs and ordering them online from small companies. But it did happen that we were once left without solid soap and my husband went to a big store and bought one of those enormous packages of five dozen of what he thought was at least a basic soap, with very few ingredients. We still have a lot of that soap after two years. Now I have finally discovered a grocery store solid soap that is both less expensive and perfectly natural. It’s called Olivella, it’s made in Italy from mostly saponified olive oil and water. It does have added glycerin and the one that I bought also has fragrance (but there is a fragrance-free option). And those are all the ingredients. Four of them. Fantastic, right? But the biggest natural living improvement in our household has been the new water filtering system. I have been wanting it since … forever (it felt like it). Maybe two years ago I did all the research on water filtration systems and all the undesirable things in the water that I would like out. A big thing for me has been the fluoride. Our town water is fluoridated for the benefit of its good people and their teeth. Besides not agreeing to be medicated against my will and without my approval, I have been frightened by the controversy about the fluoride that they put in water, and how it is chemical plant waste, how it can affect the endocrine system and thyroid function, how there are risks of developmental issues in infants and how it doesn’t actually do much good that would balance all this bad. Even the U.S. Environmental Protection Agency has issued a statement of concern and urged towns to reevaluate their fluoridation policies against the new studies. All this is frightening. There are few (and expensive) water filtering systems, however, that can remove fluoride. One of them, which I found most convenient for my family and our lifestyle, is the Berkey water filtration system. One line that sold it for me was that these systems are used by relief organizations like the UNICEF, Peace Corps and the Red Cross. Another line is that you can fill it with water from a stagnant lake or a puddle, and you would get good drinking water at the other end. The filters do not need to be replaced for five to 10 years, depending on how much water you use. It doesn’t require any electricity and it’s made of stainless steel. Isn’t it perfect? They should pay me for how much I am advertising for them. I can’t help myself. I feel it’s a public service I’m doing here. So, yeah, this is it. Come to our house if you want to freshen up, wash you hands and face and have a glass of cool, clean water.